Raymond’s life began on July 9, 1956 in Guam. He is the son of Antonia (Taitague) Debita and Randolph Compo. Raymond was united in marriage to the former Brenda Countryman Elliott on June 14, 1991 in Bartlesville, Oklahoma. He worked as a supervisor for Pioneer Balloon in El Dorado. Raymond enjoyed playing baseball, fishing and hunting. 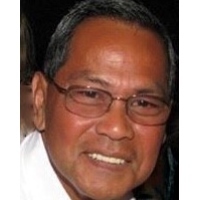 He was especially good at cooking Chamorro barbeque and enjoyed spending time with family and friends. His greatest joy was his family which includes his wife Brenda Debita of El Dorado, children Raymond “Boomer” (Rebecca) Debita II of El Dorado, Josh ( Whitney) Debita of El Dorado, Larry Mantanona of El Dorado, Dominic (Kilee) Debita of Manhattan, Chance (Tiffany) Elliott of Douglass and Nathan Elliott of Leon; 18 grandchildren and one great grandchild; his mother Antonia Debita of Augusta; siblings Elizabeth (Larry) Garcia of Augusta, Linda Debita of Hawaii, Barbara Mantanona of Guam, Susan (Sixto) Quintanilla of Guam, Victoria (Victor) Calip of North Carolina and Julie (Robert) Padilla of California and many nieces and nephews. Raymond passed away on Wednesday October 17, 2018 at Susan B. Allen Memorial Hospital. He is preceded in death by his father Randolph Compo, two brothers Jesse and Leon Debita, and brother in law Luis Mantanona. His family will gather with friends on Saturday from 1-5 p.m. at the Kirby-Morris Life Event Center (224 W. Ash) to celebrate his life and enjoy his favorite barbeque. Memorial contributions in Raymond’s name may be directed to the Susan B. Allen Memorial Hospital Foundation/ Matt Cross Nutrition Program. Please sign his online guestbook and leave a memory of Raymond at www.carlsoncolonial.com.